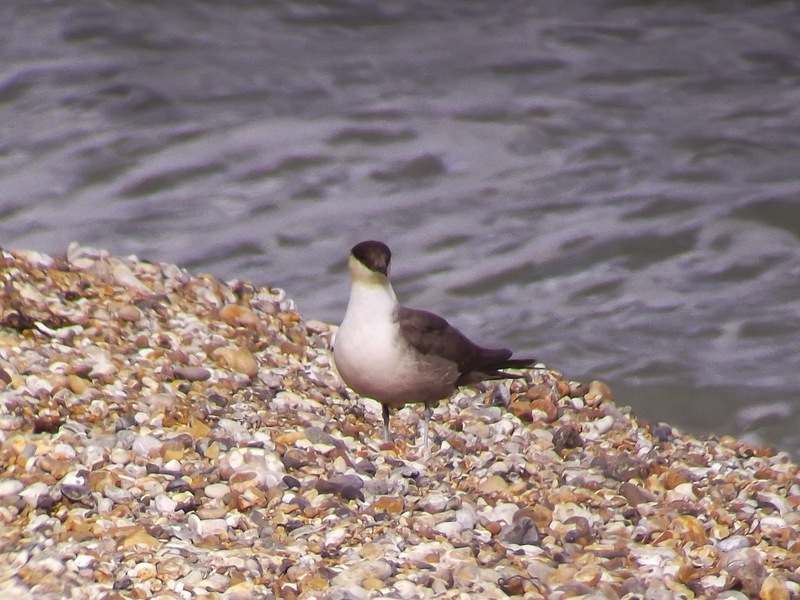 I never thought I'd get the chance but yesterday I managed to find time to travel down to Selsey Bill to see the sub-adult Long-tailed Skua. I was sure this fantastic bird wouldn't stick around for as long as it has, but two weeks since it was first reported it is still in the area. I'd hopde to see it on my birthday on the 7th, but with no reports coming through that convinced me it was worth taking a chance I went for the Bee-eaters instead – which proved to be a good choice. Annie came with me for the afternoon's distraction on Thursday – and after driving under storm-filled clouds we arrived just after 3pm at Church Norton, where it had last been reported just before midday. 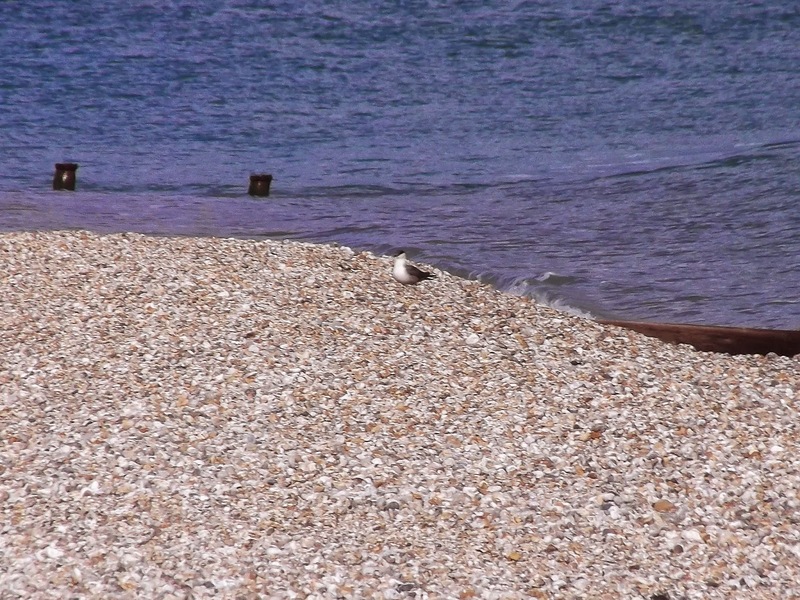 A birder we bumped into, however, said the bird was last seen further up the beach. I assumed this might not be far from the lifeboat launch, where it had been seen on many occasions. 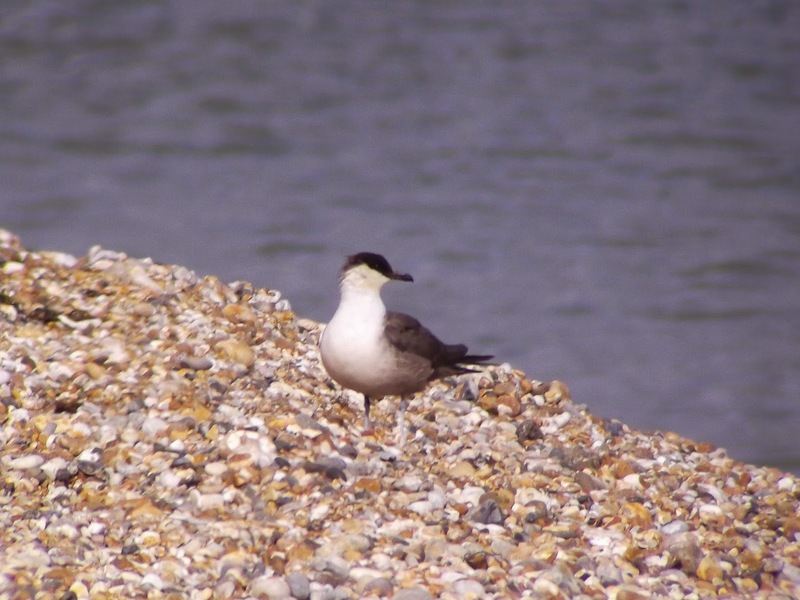 We headed over but apart from plenty of Common Terns and Turnstones, there was no sign. I was at fault for not doing my homework. I should have studied the area and previous reports more closely prior to driving down and as a consequence I compromised a great opportunity to see the Skua close up. I put a tweet out for help, and luckily birding mate Dave Baker responded. He said the bird was last seen on the shingle spit by Park Copse, a favoured spot. After driving along a track to where we could see plenty of birders with scopes, I tried to find a parking spot. The first birder I saw was Lee Evans, who came up and asked if I was looking for the Skua. I confirmed I was, but he said it had just flown off having been on the beach for some time. That wasn't what I wanted to hear. I'd literally missed it by a couple of minutes. The stress began to build. 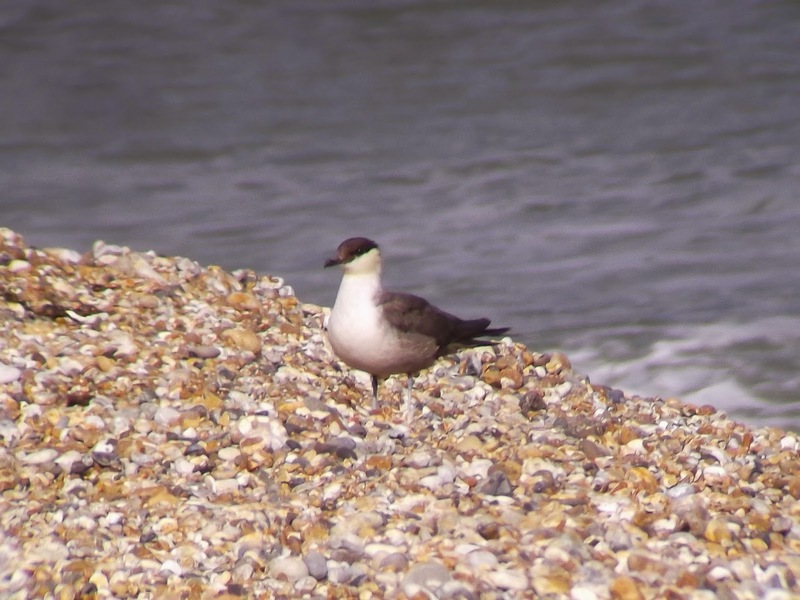 Lee suggested it might have flown up to the grass banking next to the Selsey Bill seawatch area, while others suggested it could turn up anywhere, as it liked to fly up and down the coast, from Bognor Regis to Bracklesham Bay – and anywhere in-between. Bloody hell. This was turning into a bit of a nightmare. Off to Selsey Bill we went, but there was no sign so we drove along Kingsway and parked up near the lifeboat launch again, and waited. I really began to think our journey was going to be a complete waste of time when suddenly I saw a bird out at sea that was clearly not a tern or a gull. Bingo! 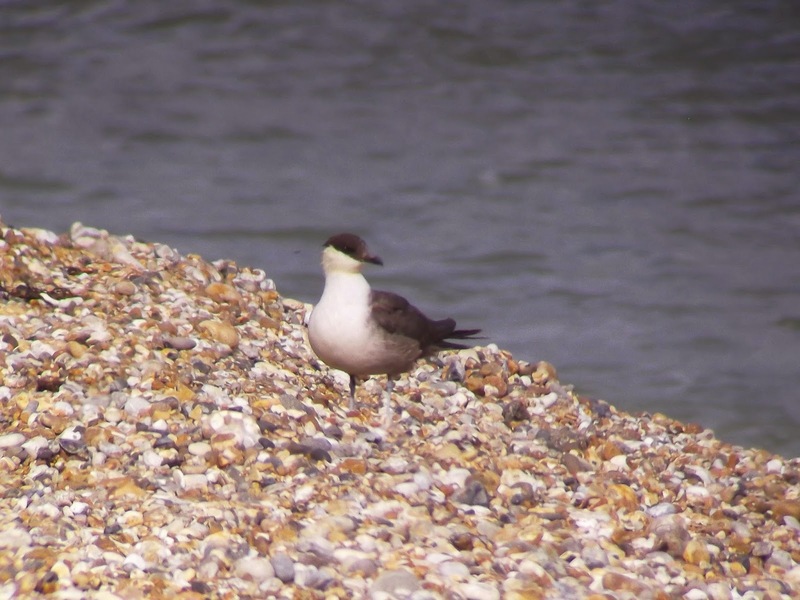 After a bit of jostling with some of the terns by the launch the Long-tailed Skua circled and climbed high before our heading way, flying over our heads and off towards Selsey Bill and out of sight. I thought that was going to be it. It was hard to know how long it would be before he returned, but as it turned out it wasn't long. A few minutes later the Long-tailed Skua was back. After some more tern jousting he cruised low over the sea and, by a stroke of luck, landed on the shingle beach just 50 yards away from where we were standing. We shuffled up the path to get a closer view. He stayed put for a few minutes, which gave us enough time to get a really good look at this handsome bird. After that he flew off out to sea before landing on the water and then he appeared to head off back to his favoured spot down at Park Copse. We could have gone back, but the heavens then opened with a vengeance.